Still, it's a very capable and handsome car. Those looking for more aggressive performance should wait for the redesigned Lancer Evolution that will show up here early next year. 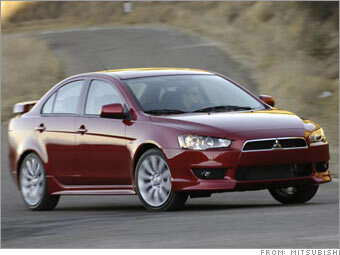 Possibly the best thing about the Lancer is its stereo. It sounds great and comes with a 30-gig harddrive that stores a copy of any CD you play in it. Album names and track names are grabbed wirelessly from an Internet database. After a while, it's like having an enormous jukebox right in the car.